Why I love the half-marathon! Having run several 10k races and recently completed a marathon, I have been thinking a lot about my own distance preferences during training. Of course, a varied training plan is definitely required, and I am only commenting on the types of distances I enjoy the most during training. During my preparation for the London marathon, I managed to bring my 10k times down to sub-45, meaning that it is now a relatively short (duration) and fairly fast race. As I have become more and more keen about running, my perception about race distances have definitely changed. In terms of “effort required”, the 5k run has now become my 10k, and how I approached a 10k run is now how I feel about the half-marathon. Whilst I enjoy 10k runs, they are over too quick for my liking. A marathon on the other hand is an amazing experience, but does require some preparation to ensure a comfortable and enjoyable running experience! Also, I find running more than 18-20 miles during training to be a little underwhelming, as there are no crowds to spur you on! 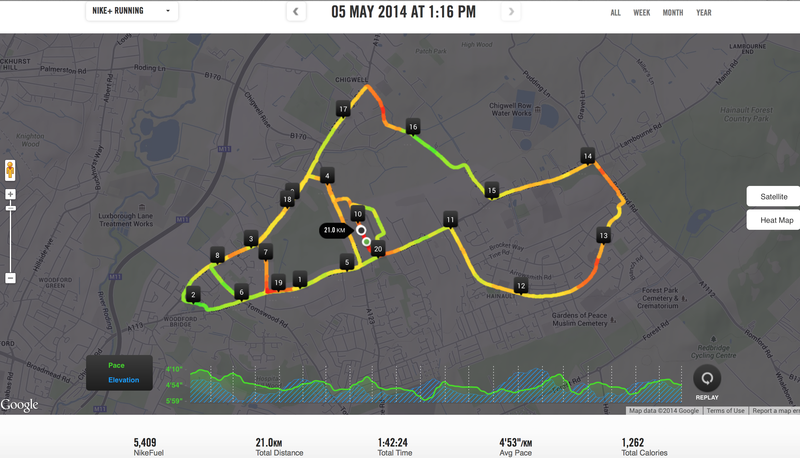 For me personally, the sweet spot for my training runs is currently the half-marathon (21.1km). My times for this currently range between 1hr 40min to 1hr 45min, which I find very comfortable, usually pacing my self at around 4’50”/km. I have signed up the Hackney Half Marathon in June 2014, so will be looking for a sub-1hr 40min during that event!